To offer a chilled glass of HELLER ESTATE golden, mountain grown CHENIN BLANC is certainly a gesture that all guests and visitors appreciate and take delight in, and we too, are also most happy in the quality of this varietal we grow at our mountain vineyards, overlooking the Pacific coast in California. The cool mountain breezes, loamy soil, and dry-farmed production create this magnificent wine. What a wonderful way to start off a relationship or enhance a meeting! The vines, which were brought to America from France by settlers in the 19th Century, have produced some phenomenal wines under the special conditions we grow them. All of these grapes are naturally grown, without the use of herbicides or pesticides, and the quality is enhanced by the fact that we stress the vines to seek the water levels provided by springs running some thirty feet under our vineyards’ surface. Consequently, they are USDA-CERTIFIED ORGANICALLY GROWN. All of the grapes used in the production of these wines originate in our vineyards only and, therefore, the wines are all Estate bottled. We do not source fruit from other vineyards. 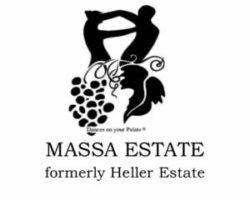 Order a glass, bottle or case of our HELLER ESTATE ORGANICALLY GROWN CHENIN BLANC today, and we know that you will be most pleased and a convert forever.